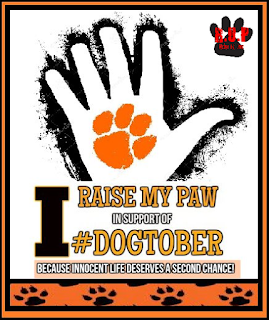 RAISE UR PAW NEWS: #DOGTOBER - "FALL" for a Dog In Need! DO YOU RAISE UR PAW FOR SECOND CHANCES????? If you do then OCTOBER is the perfect month to do so - especially since it is "DOGTOBER" adopt a sheltered dog month. Countless lives are always in need of loving homes and families and are waiting for that special someone like you to either adopt, foster, rescue them or even SHARE them with others in hopes of getting that new lease on life that they fully deserve. We at RAISE UR PAW are hoping to achieve this goal, and are reaching out to everyone around the globe to do the same -- even if you can't adopt, foster etc - your support and voice is just as important, because as a voice you are bringing attention to the desperate need of those loving homes and families that these innocent babies are reaching out for. If you have a moment, or even just a single second please RAISE UR PAW and put an orange pawprint upon your palm as a representation that you are taking these innocent babies by the paw and leading them to a new life, and being a pathway towards their dream, a family and home. We can all make the difference - and we can all change the world for the innocent lives forever. ADOPT, FOSTER, RESCUE, SPREAD THE MESSAGE - SHARE THE HOPE!